Well Intervention Market size in 2017 was valued over USD 11 billion and is predicted to grow over 6% by 2024. Growing number of matured oil & gas fields coupled with increasing demand for refined petroleum products on account of rapid urbanization and industrialization across the emerging economies will foster the well intervention market. A sturdy growth in the aging oilfields accompanied by a lower exploration rate of newer fields will accelerate the industry growth. In addition, the increasing demand for logging services on account of change in geological sub structure of the wells will further propel in the industry growth. Increasing investments pertaining to technological advancements to improve the efficiency across the complete spectrum of exploration & production activities will stimulate the global market growth. In addition, the increasing subsea production along with ongoing government focus toward development of aging fields will propel the industry growth. Favourable government taxation schemes to develop these reserves will positively influence the technology adoption. Logging & bottom hole survey accounted for over USD 2 billion in 2017. Increasing exploration of shale reserves across the U.S. along with upsurge in gas demand across the emerging economies including India, Indonesia, Thailand and Malaysia will stimulate the well intervention market. Well logging is used to acquire subsurface data and is curtailed in wells when the conditions begin to deteriorate. Well stimulation is set to grow on account of increasing demand for hydraulic fracturing and matrix treatments. These services are performed to enhance, improve and restore the production of hydrocarbons from a well that is hindered by the skin formation near the wellbore area. Accelerating demand for revitalizing of abandoned fields to increase the production rate will stimulate the well intervention market size. Light well intervention market size accounted for over 50% in 2017. Increasing need to enhance recovery rate from maturing oil & gas wells on account of rising pressure to meet the demand supply mismatch will encourage the technology adoption. Lowering of tools and sensors including slicklines, coiled tubing and wireline to reduce the possibility of blockages are some of the underline parameters which will enhance the technology growth. In addition, it also measures the downhole flow data, pressure and temperature range in the well. Heavy well intervention market will grow on account of increasing exploration activities across the subsea areas. The technology is primarily used to replace parts in the wellbore including pumps, valves and tubing strings. In addition, the service is also used to plug & abandon an original producing zone and reconfigure the wells to produce from a secondary zone. Onshore well intervention market is anticipated to witness a gain of over 6% by 2024. Growing number of matured fields coupled with increasing focus toward heavy oil reserves will boost the industry growth. The World Oil in 2017, reported a 25% increase in onshore wells drilled across Brazil when compared with 251 wells in 2016. 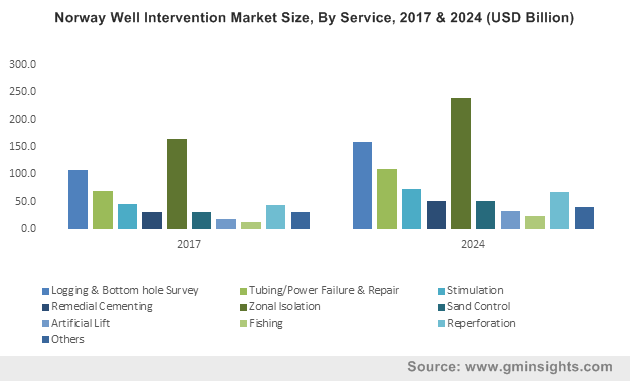 Increasing investments toward subsea production along with favourable regulatory policies pertaining to deep water drilling activities will stimulate the offshore well intervention market share. In addition, shifting trends toward offshore field production on account of economic benefits and availability of large volume of untapped reserves will positively impact the product penetration. The U.S. market is set to exceed USD 3 billion by 2024. Growing existence of low-pressure oil wells along with continuous increase in energy consumption will propel the industry growth. In addition, the increasing number of matured oil fields along with growing focus toward shale reserves will complement the business landscape. According to BP statistical Review, the oil consumption across the U.S. was 12,336 million barrels per day in 2016 which increased to 13,057 million barrels per day in 2017. Availability of large volume of proven oil reserves coupled with escalating focus toward aging oil fields will stimulate the Saudi Arabia market size. Ongoing efforts toward stabilizing of oil & gas industry along with increasing investment across upstream sector will further compliment the business growth. In addition, rapid development of urban areas along with growing industrial base across the nation will positively influence the technology adoption. 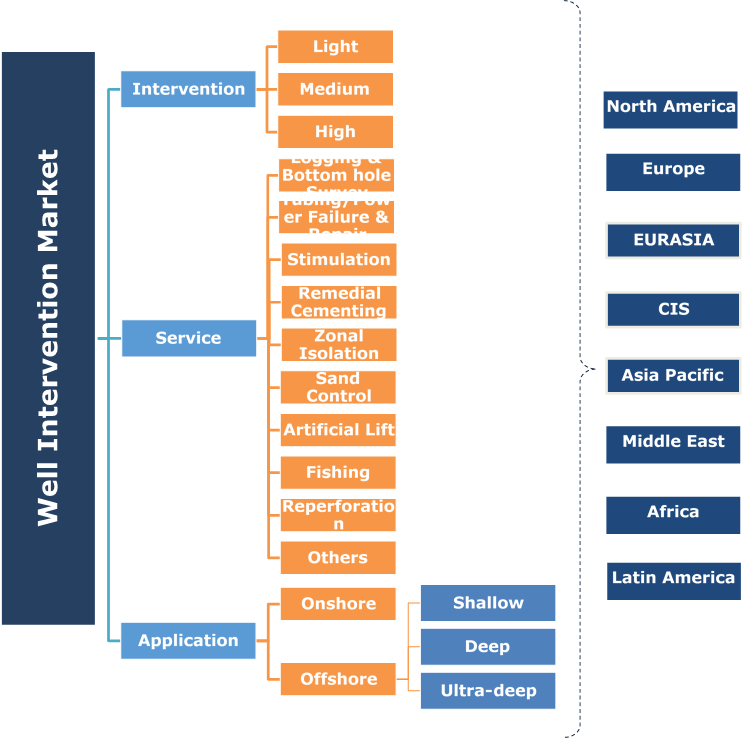 Key industry players across the well intervention market includes Halliburton, Weatherford, Archer, Calfrac, Cudd Energy, National OilWell Varaco, Superior Energy, Trican, Omega, Expro, Helix, Altus, Oceaneering, Hunting Energy, Basic Energy, Weltec, Technipfmc, GE, DeepWell, Tenaris, Schlumberger, Exxon and Archer. The leading industry players are focusing toward inorganic growth ventures to expand their business presence. In addition, extensive research & development activities along with increasing investments toward development of maturing fields has been a key strategic inference for leading industry players. The well intervention are operations carried out on an oil & gas well during the end of its production life. These services alter the state of well, manages production and gathers data related to the geological conditions of the well. The system finds wide application across depleted or matured fields which are no longer productive under their natural pressure. The technology is widely accepted across the industry in three forms light, medium and high intervention and are being deployed based on the geophysical and substrata conditions of the fields.